To find a new working process that helps us to create a more pleasant eating environment for the children – a new way of thinking that can be reused in other reconstructions or new buildings. To create a pleasant eating environment for the children, which we hope can reduce food waste since the children will want to stay in the cafeteria and finish their meals, we decided to work with a light designer in a planned rebuilding of the cafeteria. 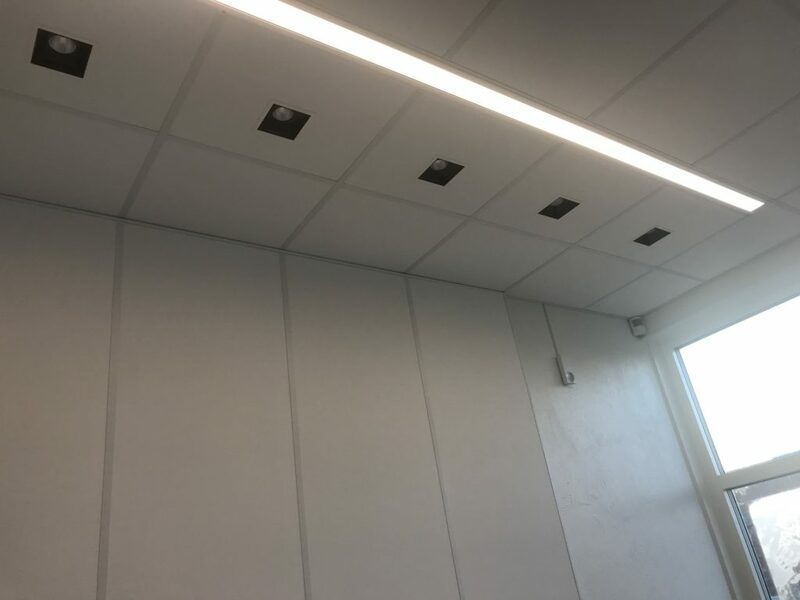 We wanted to install a new and innovative lighting solution that would create a more pleasant environment with less noise and reduced food waste as a result. We also decided to involve a lighting company to get the market’s view and knowledge into our demo. We arranged a company pitch event where light designers could present their ideas, and after this we decided to work with Lightscapes. Lightscapes was hoping to contribute with for example some thinking outside the box, knowledge about what is good light for people, design and planning for a beautiful solution, developing concepts to create a good flow and a nice ambience. When we had decided on our partners – Lightscapes and Zumtobel – we formed a task group consisting of representatives from the two companies, the project manager for our demo, the project manager for the rebuilding, the project’s architect, electrical consultant, representatives from the school and from the department in charge of school meals. Together we formed a common baseline by participating in study visits and learning more about lighting from the light designer. After that we had several working meetings between which the light designer worked on the light plan and presented drafts. Eventually the plan could be decided and the procurement phase and then the building and installation phases followed. 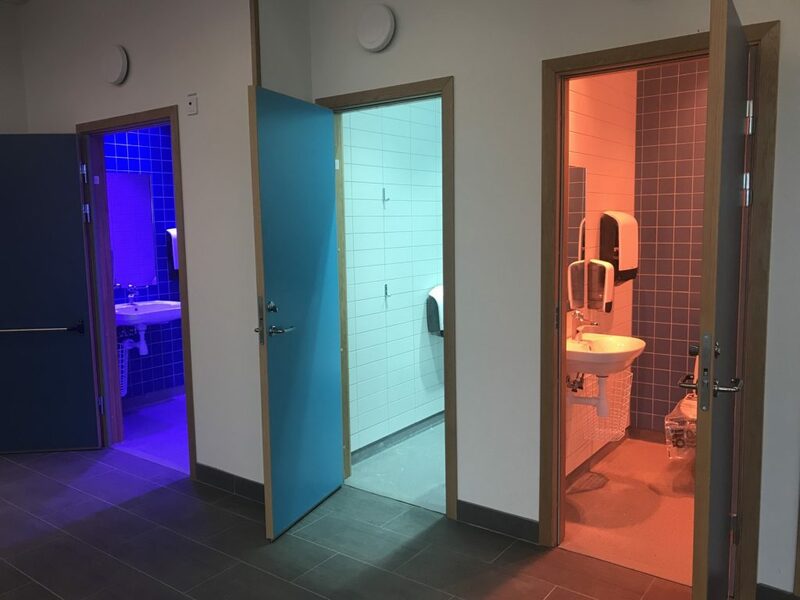 The light designer presented the project and the light plan to the contracted building company, to make sure they followed the plan minutely. The light designer will also return to program the lighting. The formation of the task group with all its competences was crucial. For example the practical conditions were given by the electrical consultant and the close collaboration with the architect ensured enough daylight, good sight-lines and a harmony between light, colours and materials. 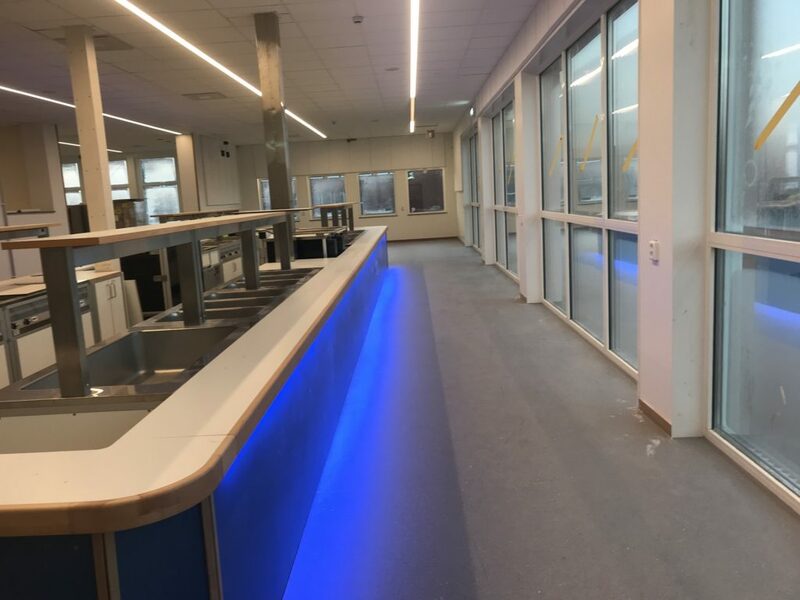 We are hoping to be able to measure reduced food waste, lower noise levels, increased comfort/well-being, a more positive perception of the light, lower installed effect and an increased number of children wanting to eat in the cafeteria. Sandbyvägen 18, 247 51 Dalby, Sweden. Please contact Elin Dalaryd, elin.dalaryd@lund.se, to arrange a visit. Lund municipality will build and refurbish several cafeterias, where the experiences from this project can be used. It could also be used by, for example, other municipalities and real estate owners building cafeterias.